Included in my Famous Scientists BUNDLE.You may also like my We HEART Science collaboration poster. Art with Jenny K. collaboration posters are great for any age and are designed to complement or supplement any lesson or unit. They are the perfect anticipatory set to pique your students’ interest or a great extension to finish your studies with a WOW. 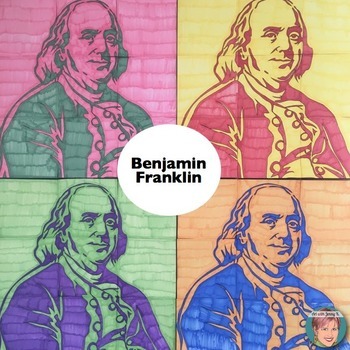 Your students will be talking about this Pop Art Benjamin Franklin poster for weeks to come and will always remember exactly which piece was “theirs” when they see it on display! This lesson is very easy. Each student is given one section of a large mosaic poster to color according to the instructions on each sheet. Once all sheets are colored and cut out they are then assembled to reveal a large multi-colored mosaic/poster/mural of Benjamin Franklin in various colors. You will need crayons, colored pencils or markers in green, pink, red, yellow, light green, purple, blue and orange. ~Final poster: Approx. 42 in. x 42 in. (depending on your printer settings). 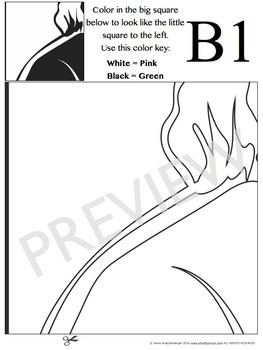 Colors needed: pink/green, yellow/red, light green/purple and orange/blue (in crayons, markers or colored pencils). Some teachers like to show their students what they will be making (that is why I have included a final example) and others like to keep it a secret until the end for a really fun surprise! This lesson is not hard but is more challenging than the coloring version in lesson #1. In this lesson, each student will draw their own grid piece using a small version of their assigned gridcell as a reference. Once the pieces are drawn and cut out, the classroom poster can be assembled. 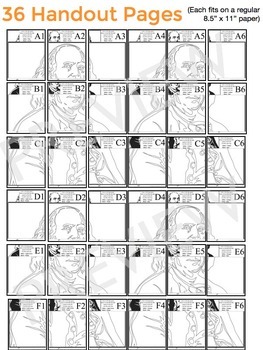 This lesson engenders a lot of cooperation among students to get all of the drawings within the individual gridcells to line up well and to produce a nice looking final poster of Benjamin Franklin . This is all about working together! 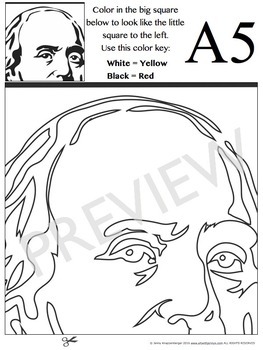 ~Benjamin Franklin quote coloring page. Teachers love to color and that's why I made some coloring pages just for teacher...they are FREE and can be found by clicking here.